Available for purchase June 15th. CLICK HERE for further product details. You have until 7am ET, June 11th to leave your comment and be eligible to win. Only one comment per person please. One randomly selected winner will be posted on the June Release Winners Page by 10PM ET on June 15th. To see more from Amy Sheffer, CLICK HERE. These sets and creations are amazing! So colorful and detailed and fun! Oh my….the colors & everything are perfect! This one is very versatile! I love it all! But those turtles…they’re the best! So cute! Very pretty colors in the card samples—love the sea theme! These sets are so adorable! Can’t wait to create with them! Oh my – I love the name of these new sets – Salt Air – and the beautiful ocean-related images! So lovely! Oh how adorable! The projects are so cute and colorful! Salt air: Flora & Fauna is so magical and beautiful! Thanks for the wonderful creations! Just beautiful PTI. Love all the details. I love everything about all of these sets! These cards are all lovely. The stamp sets are gorgeous and the details that have been achieved are wonderful. Loving the detail that you get from the multi-step images here! Love the video intro to the new stamp and die sets which are just perfect for summer cards and projects! So many fun stamps and perfect for summer projects! The sea turtles, the Sea horses, the jellyfish…my heart is about to burst with all this sea loveliness! Best set ever! Can’t wait for the realease date. Today’s cards are little ocean masterpieces! Looks like must have products to do my Hawaii and Puerto Rico vacation albums! Really nice new stamps- they remind me of my snorkeling adventures with my husband when we were newly together and married. I also like the new format of the video, well done! I’ve been looking for an underwater set that I didn’t have to color and this one is perfect! I really like how Betsy stamped the jellyfish on dark cardstock. They look like they’re glowing! Love the detail in these stamp sets. The jelly fish in the powders? Brilliant. Great sets! Extremely excited about this new release! Thanks for all the beautiful and inspirational card examples… can’t wait for June15th! LOVE IT!! so sweet and super cute!! Love these sets! I live on the coast so these are perfect! This set is perfect. I love the animals and it is so well thought out and looks easy to stamp as well. Several companies already have ocean life sets but these are the cutest by far! Definitely on my wish list! We’ve the under sea world. So colorful and many possibilities. Can’t wait to play with it. Adorable salt air sets! Love everything about them. Beautiful under the sea cards. 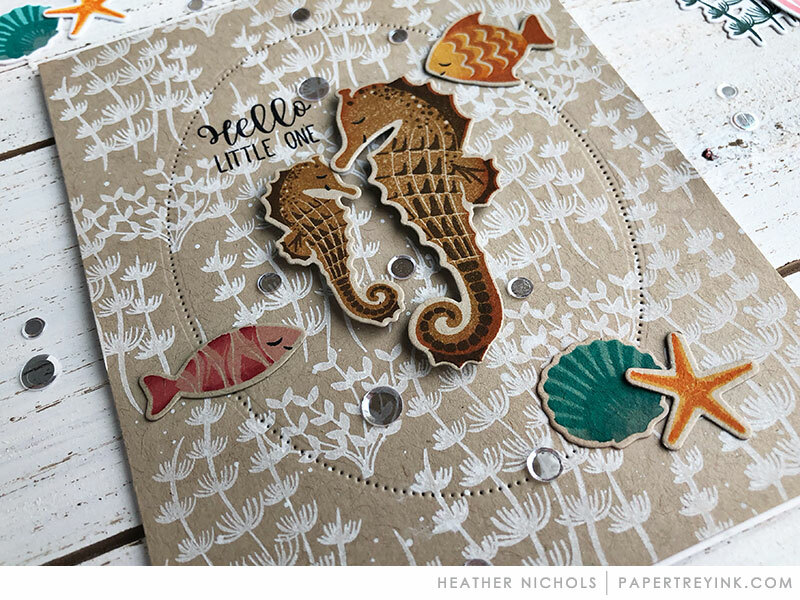 Very creative underwater stamps & dies,adorable sea horses. Betsy’s dark color card withe jelly fish is beautiful so realistic looking! These are beautiful. The turtle is fanatastic!! Fabulous sets for people who don’t like to colour. Betsy put beautiful details into those stamps! The stamps in this,set aremgorgeous! I love all the,sea weed and the sea creatures! These sets will surely make ocean-loving hearts skip a beat! They are fabulous! Love the New under water stamps. Fabulous projects today. These sets look fabulous! The sample cards are beautiful! Those little sea horses are simply adorable! Cheers. These images are so adorable! Glad to SEA the underwater theme! This is just a beautiful set! I like the real-looking, not “cutesy” images. Every single card is gorgeous! Fabulous creations! Love the sets! I love everything about today! My turtles and sea horses are adorable!!!! I was so excited when I saw them in the sneak peak yesterday knew they we’re going to be mine! Oh, so cute! I really like these new sets. I’ve never cared for turtle stamps and dies, but I adore these! All the examples of sea life are beautiful!! These sets are SO adorable!!! Must have sets….and the variety of sayings make the sets very versatile. Too cute…love these two sets!! Amazing! Amazing! Amazing! I love everything shown today! Betsy has outdone herself again! Love it! Wow I love these images! The cards are fabulous! Oh…WOW! These are awesome!! I’m teaching, our Sunday school kids, missionary lessons from the Caribbean this summer. How perfect are these?!!! Must have! Beautiful examples!! Thank you! I so love the ocean theme today! There are so many ocean sets out there, but PTI’s is by far my favorite! I can’t wait to get my hands on everything! Very cool underwater effects on today’s cards! Beautiful cards! Wow what a variety. Love it all! Colorful and cute! Especially love the turtles! So love the ocean theme today. The little sea creatures are adorable!!! So cute! Love the Flora and Fauna! The ocean theme is cool! I really like the sea horses. Outstanding projects with the underwater creatures! What beautiful cards! Simply amazing! Everything is so colorful! Oh my goodness gracious!! What away to begin!! The card are all so stunning, so breathtakingly beautiful!! I can’t wait to see what you have have in store for us next!!! I love the new set. I didn’t think I needed any underwater sea creatures…I was wrong! These sets are a “must have” for my stamp collection … beautiful and whimsical samples from the amazing design team! Love the video introduction. When I saw these sets on the sneak peak I was so excited. I just love the underwater theme. Oh my goodness!! I love love love the new sea creatures. Your sentiments are darling!! Awesome job!!!!! Another irresistible set of products from Betsy! Just love the versatility! I love all of the sea-themed sets and sentiments! These are so beautifully designed and unlike anything I have in my stamping collection. Beautifully done! The designs are all just stunning! I’m all about ocean themes. Love these new sets and samples! The turtle’ly’ sentiment is so fun. My nieces will go nuts for it. The colors and the vivid scenes the design team created are just astounding. Love the inspiration they’ve provided. I am loving this set of products. The flora one is so complete in the types of underwater plants available to stamp and the jellyfish are so realistic looking. Just great. Gorgeous product suite. Beautiful samples. Can’t wait until release day! I have to have this whole set! Can’t wait to order. Everyone in our family loves the water and the beach, and I have lots of Summer birthdays coming up in our family. On my goodness, this is wonderful. I need it all. These are beautiful stamps! So detailed and realistic. Love! How fun!!! Great cards from the DT. What colors today! And the sweetness of those turtles are too much! Lovely projects ladies! This set is gorgeous, love the turtles and sea animals. The cards are beautiful. Oh my goodness! These sets and creations are just amazing! These sees are a must have for me. The samples have beautiful collectors and are so detailed and fun! Wonderful and fresh! Please, please order a good supply for release night! Oh I have been waiting for you to do a set like this for ages! I adore the many ways the team has used the combination of these sets and the adorable sentiments! Love this , so cool and fun! Absolutely adorable! Love all of the sea elements. Especially the seahorses and jelly fish. I love it all! It all works so wonderfully together. I like the smaller price point of the sentiment set. A lot of bang for your buck, and plenty to choose from! Wow! Love the sophisticated look to these sea themed sets! What gorgeous projects showcased by the Design Team! Like the jellyfish and hugs and squishes sentiment. Nice job team. Makes this Midwesterner want to put her feet in the water and feel the ocean breeze. Oh my goodness, I love these sets! The sea turtles are completely adorable! The turtles are totally adorable! So many creative ideas! Betsy’s deep water looking scene is so ethereal. You had me with the preview video…can’t wait to play with this spectacular set! Love the beautiful, fun, playful projects today! Salt Air is every I didn’t know I wanted! The samples are darling, can’t wait to create my own underwater scenes. LOVE the Underwater Sea sets, the turtle and sea horses are super cute. LOVE all the different background scenes the DT created for these sea creatures and shells! Very sweet flora and fauna, and it’s great to have the separate sentiments to use with either, or both! These sets are so fun! I love the turtles!!! The team artwork is amazing as always! WOW! WOW! WOW!! I just love this release! All those cute sea creatures. And the die with the water like waves! AWESOME! Plus all the cards made are more than stunning! This is one amazing release! I am so so excited for it! Oh my goodness!!! I’m totally in love for all the Salt Air Sets! They’re stunning!!! Perfect to make amazing summer projects!!! I thought I could see Betsy’s creative hand in these beautiful stamp sets. They are so cute. Love the detail especially in the Fuana set. Looking forward to a great release week! Wow! Betsy hit a home run with these new products. Love the multi layer coloring options. Gorgeous sea creatures and plant life! The turtles are so adorable. So many things to make under water scenes with. What a great family of sets for summer! “Fauna” is cute, and all three lean that way, but it looks like “Flora” could make some really elegant cards, too. Love the sentiments and images of Betsy’s newest set! So sweet! Beautiful stamp sets today and so much inspiration!! The ocean theme stamps were designed perfectly!! I love all the details! These sets are amazing, stunning, beautiful, perfect…… I could go on and on! What a cute theme…don’t live by the ocean, but I have turtles in my pond! Love all from today. They are must haves for sure. I’ve been waiting for these kinds of stamps and dies. You guys have really done it this time! I can hardly wait to own these darling sets! Well, done team! I love the variety of underwater plants and the layered colours. They look amazing! The jellyfish and fish look really pretty too. That itty bitty baby turtle….*squee*!! Wonderful images for under the sea! Fantastic little seat creatures! Water scenes always attract me, and this release looks like a must have. I am lovin’ this entire collection – can’t wait to get creative with it!!! What awesome samples with these beautiful stamps! Love these underwater scenes! Wow!! Gorgeous projects!! Love these ocean themed sets!! I love the new Sea release. It seems like other companies are doing the same, but I am much more impressed with yours. More variety in the stamps which gives a lot more choices when making cards. Great job! Also, the designers are showcasing a great variety of colors and layouts. All things Salt Air……Yes, please!!! These cards are breathtakingly beautiful. The new style of the website is also very enjoyable! My coffee is gone, and I am still browsing through all of the great DT samples! There are lots of ocean sets out there, especially right now, but this is one of the absolute BEST! Great, great job! I have not jumped on the sea theme stamps from other companies, thank goodness! Because Papertrey & Betsy V have outdone all others by a mile!! I love every single thing about the Salt Air stamps, from the sweetest faces to all of the color options with the layering on almost every image. All of these sea elements offer so much versatility! The designs just get better and better – that’s me staying awake till 3am so I can order from the U.K.
Beauty sleep is so overrated !!!! 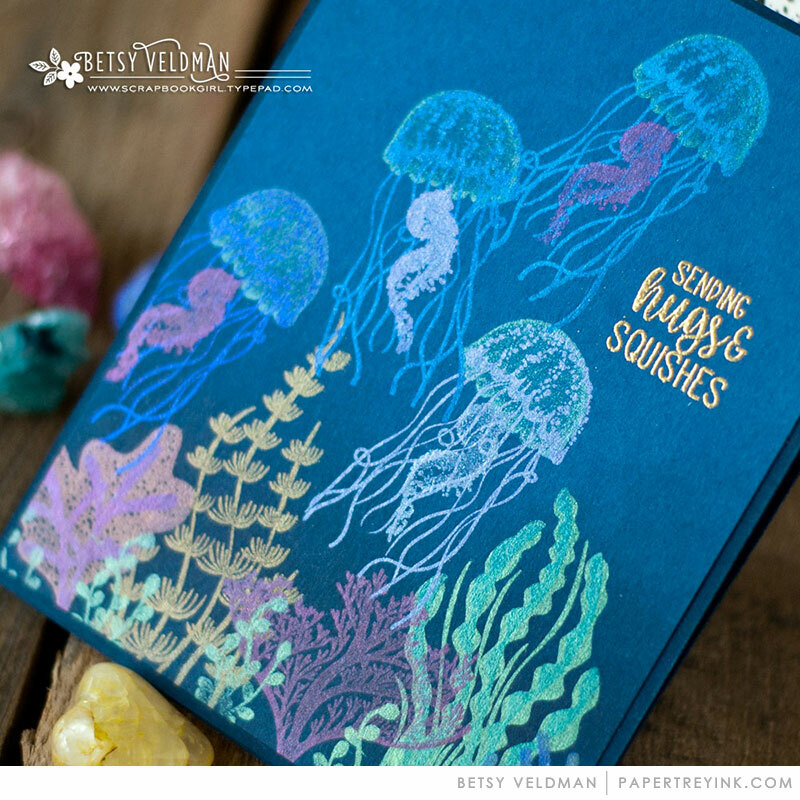 I liked Betsy’s card with jelly fish using mica powders…very pretty. What a fun new set & fabulous examples by the DT! I appreciate the video because of the personal interaction and Betsy has created another masterpiece collection. You can do so many things with these stamps and dies. Stephanie’s simple style is my favorite but all the cards today are stunning! Looking forward to tomorrow. i love all the beautiful cards made by the designers showcasing these beautiful sets! Great sentiments and those turtles and sea horses are so fun and sweet! Really cute new set! I LOVE the turtle…SO cute!!! Loving all of the water fun here! Such great sea worthy sentiments too! So excited for these!! Can’t wait to order them! And oh, the samples?? Turtlely awesome! I love the new Salt Air sets! They are so adorable and are definitely on my must-have list. I love everything that Betsy creates. This Salt Air collection is fantastic, what great ideas the design team has done using these sets. I’m so inspired. So many varieties of showcasing these new products! Beautifully done, ladies. I’m so excited for this set! I took marine biology in high school and was assigned to care for the seahorse tank., so those are my favorites! THe sea turtles are adorable too. love the ocean theme stamps and these are great. I.am.blown.AWAY!!! I had started scoping out ocean life stamps from other companies, because you didn’t have any, so I am SUPER excited that I don’t have to look any more. I have to have them all!!! I am ridiculously excited about this set of products, like a kid! Sooo cute and fun! All the underwater scenes are just delightful! Thanks for the inspiration! What a gorgeous underwater set! Oh my so much cuteness! All the detail to create ocean scenes is awesome. These will be such fun sets to work with. I especially like Betsy’s ethereal underwater scene using mica — it practically glows! 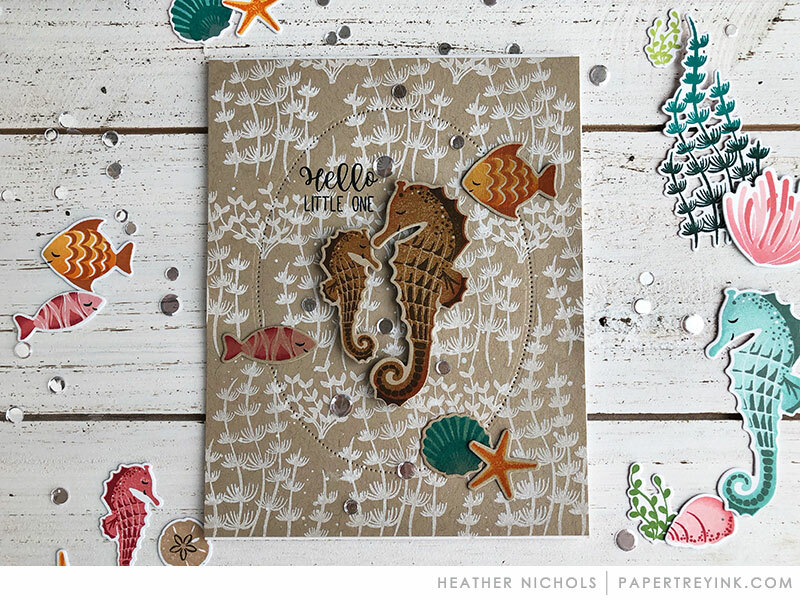 The sentiment set is adorable and such a nice complement to the sea life images. Love the cute little underwater critters! Oh my! So sweet! These stamps and dies are perfect. The sweet little fish, turtles, seahorses. All of the underwater plant life. Really just perfect. Great release. Wow, I am loving what PTI has brought up today. The samples are so colorful & cheerful! What fabulous new products today! Love the turtles, sea horses, and jelly fish! I can’t wait to see what tomorrow brings! We are attending a wedding for a young lady who adores Turtles! She has pictures of turtles from her visits to Hawaii as decor in her room. She is already a scrapbooker and wants to start card making. This is a perfect set to get her started! Oh my gosh! So cute, so many options, so many examples! Leave it to “creative Betsy” to come up with a slam dunk winner of a set. Looks like Betsy has done it again with her all-inclusive, detailed sea world. The DT has done a fabulous job showcasing these sets with such cute and colorful scenes. The wide variety of colors used by the DT shows the versatility of these sets. The examples are beautiful. Such beautiful cards from Heather! Nice summer set. I love all the images in the Salt Air Flora set! It’s so pretty! Wow, I love these stamps and dies! They are added to my wish list for sure. Great projects using them all. I am so excited for this new papertrey ink release. 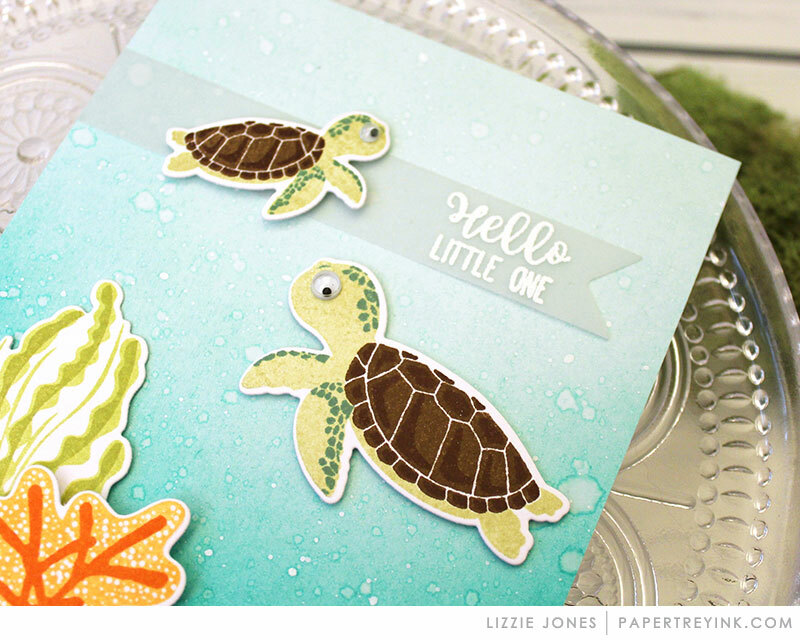 I am in love with that turtle stamp and can’t wait to create some beautiful cards using the new stamp sets! What a great variety of ocean themed elements! This is a super fun set. Love all the bright colors used in the examples. Oh my gosh, Betsy is a genius! I am LOVING these sets! Such awesome examples of these wonderful new goodies! My favorites are the Seahorses. Love the detail they have! Finally a stamp set that will let me make a decent underwater scene. I love the sea horses and the plants. Great cards. The sea-themed stamps are amazing and the Design Team interpretations are beautiful! I’ve seen many beach sets but these outshine then all! Fabulous images and cards from the team. You’ve done it again, PTI! I think this set will be mine soon, after all my name is BEACH. Hooray for ocean inspiration! These creative ideas and color combinations are simply perfect for summer crafting fun. Love all these products! Beachy items are among my favorites. Need to add these to my collection. Oh my gosh, I am freaking OUT over these designs! Goodness, I love the ocean theme products! Everything is so amazing. I especially love those adorable sea turtles!! So adorable!!! Love, love, love these new sets! My sister worked for years as a marine animal behavior specialist … these will make great cards for her. Thanks PTI and Betsy for inspiring designs. I love the underwater sea set. I love the plants and turtles and all the other things about this set. I HAVE to get these sets!!! I am a huge fan of the beach and ocean so these are perfect!! Can’t begin to express how much I adore these sets and examples! May be my favorite PTI products ever! What amazing card designs using these fun new stamp and dies sets! Beautiful creations and such fun sets. Love the underwater theme. Precious–just precious the faces on the turtles, seahorses and even the fish. They all speak to me. So gorgeous! This is a must have for my stamp collection! 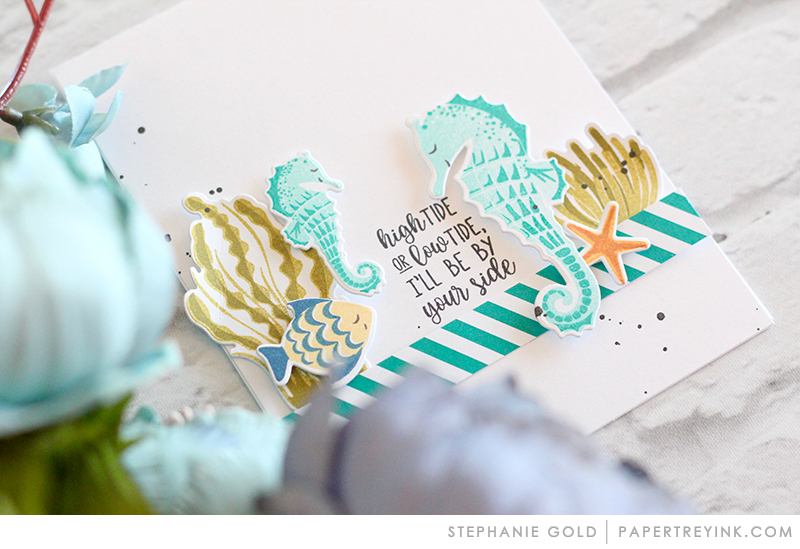 These nautical cards are so rich with details and color…so beautiful! I look forward to these new releases. So unique, so amazing! Cannot wait to order and get all these wonderful sets!! Love the sets and the new format! I love the ocean set – so colorful and versatile. That is the cutest ocean set I have seen – the turtle is adorable!!! I’m “turtally” I love with the Salt Air series! Anything beachy or nautical is really up my alley! Looking forward to seeing more! What fun! Happy to see all the sealife and beach themed stamps/dies! Okay…the extra hints on some of the cards are great…always adding new ideas. Love the beauty of your ocean themed stamps, dies etc. Sea turtles…I haven’t seen any as sweet since Squirt in Finding Nemo. Amazing sets and beautiful projects! These are very pretty with those new products! Love the accompanying video–so much fun to watch!!! Very adorable and unique set of underwater stamps! Love all the Salt Air projects! The turtles are especially cute. Love all the two-tone possibilities with the plants. So loving the new flora and fauna ocean sets! I’m loving ALL the cards by the DT! The colors are amazing. Love the whole Salt Air lineup. Great projects from the DT! I wasn’t sure about these at first glance. I’m a mountain girl at heart, but then I saw the delightful sentiments and the possibilities that went with them, I have definitely changed my mind. And most important, my only grandchild loves the ocean and the beach. I can’t wait to make here some cute cards with these sets! LOVE the under water goodies! What a great bunch of new products – so many fun possibilities for creating with these sets. Those turtles are adorable. So many creative ideas! This is the best ocean scene set there is! I am in love with the turtles. Thank you for the inspiration. I love this release. I love these new ocean stamps, the sea turtles are just amazing! Wonderful work by all the designers showcasing these new products! So adorable and unique! This whole theme can be used for a lot of fun cards! Crushing on everything on the first day! I’m in trouble… LOVE everything so far! I am generally not interested in sea/beach themd stamps or dies, but these sets are darling! I especially love the turtles and the sea horses. The cards displayed are stunning! Oh, I just love underwater images and the colors are always so amazing! The DT did a great job of creating their cards and I love them all! Love the sweet trtles and seahorse. Must have. Such beautiful samples. I love it all! These sets go together beautifully, and the DT projects are gorgeous! I just love these underwater sets. The team has made such gorgeous cards. I will definitely be getting these. Love the Salt Air: Flora and Fauna! The little sea creatures are adorable. The flora stamp set offers much more variety than I’ve seen in other underwater sets and, as a result, so much more versatility. These two sets are definitely going on my must have list. What a fun set of products! I just adore the whimsical details in all the different critters, although those little turtles are probably my favorite. What a fun day, love the whole Salt Air series. The turtle is the cutest. These are so cute, I like the swimming turtles! Such amazing talent. Great work ladies!! I love all things ocean and underwater, so these sets really shine for me, especially the turtles and jellyfish. Betsy’s jelly fish card is so stunning! So cute & so many possibilities! those sentiments are SO adorable! What fun and colourful samples today! I love all the sea stamps and sayings!!!! I “sea” some of them in my future! These are some fun ocean supplies – so detailed and pretty. The design team has really displayed them brilliantly and beautifully! I love are the undersea creations…especially Betsy’s use of the mica powders. These three go in my cart. Why do I have to wait until the 15th? This is the greatest thing ever. I have never seen such uniquely beautiful stamps! Absolutely love them! What beautifully colored and fun inspiration! Just love everything about these sets! The detail in the flora and fauna stamps is just amazing and how could I not love the wonderful rainbows of colour the design team have brought to their projects today – so vibrant and fun! 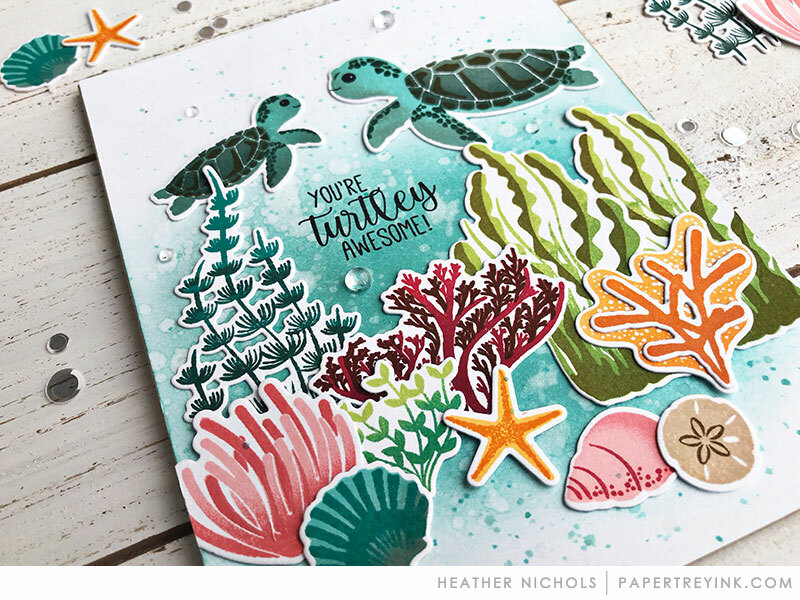 I thought I had enough shell and underwater stamps, but I definitely want those new sets coming out in mid-June! The cards are absolutely beautiful! 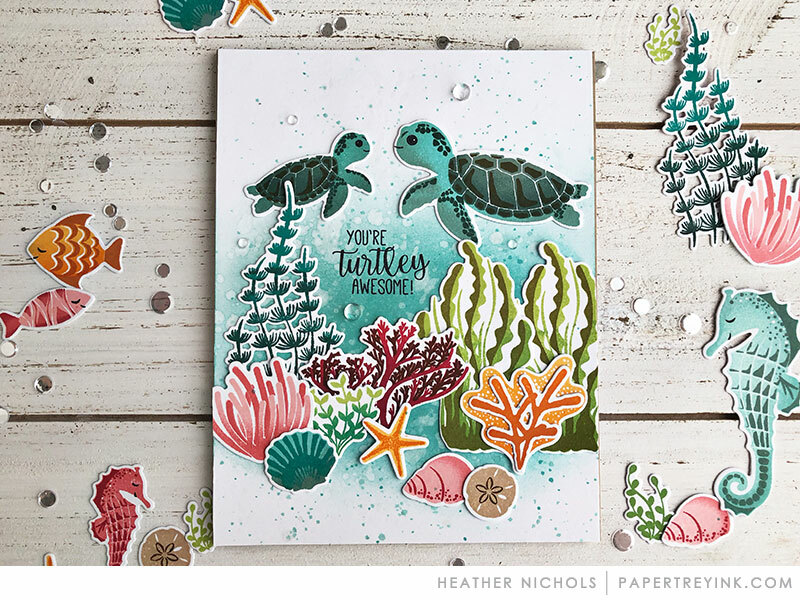 The seaweed stamps are unique and lovely and I love those seahorses and sea turtles! Can’t wait! While this wouldn’t be my theme for stamping, you can’t help but fall in love with these images. So darn cute! I just love everything I see here! The design team has done a fabulous job highlighting the new sets. 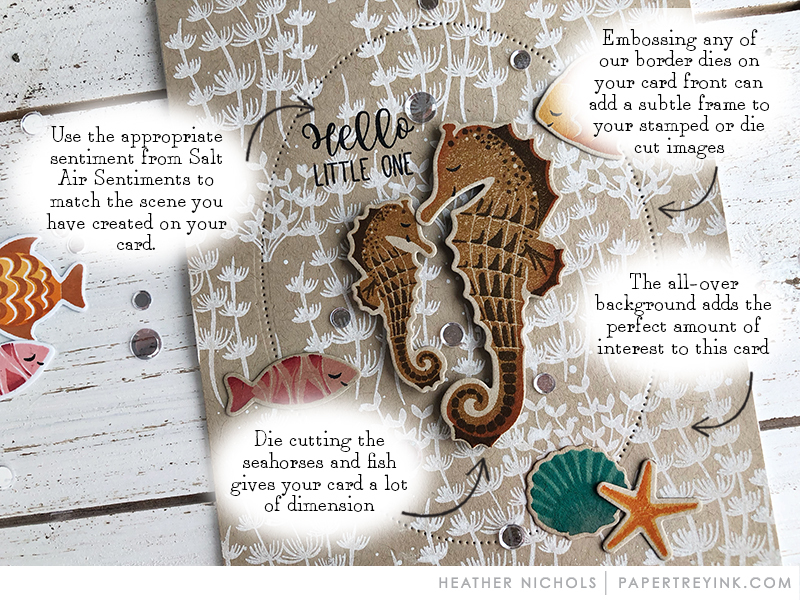 I especially love the sand dollars, starfish, and cute seahorses! What a fun start to the June countdown! These sets make me ready for summer! So unique! Colors are so pretty. Wow, Betsy never disappoints, great samples! Anything nautical!!! Love the turtles! These sets are so incredibly gorgeous, though I’m not the least bit surprised as anything Betsy creates is certain to be spectacular!! Thanks for all of the phenomenal and beautiful inspiration…can’t wait to get my hands on these products! Be still my heart!! Sea creatures! I know this will sell out fast. Love love!! What fun new sets & lovely inspiration! Oh I am so happy with these sets! I already have plans for them. I live at the beach in the tropics and i will use them to make Christmas cards this year. I”m so excited!!!!!! The Salt Air sets are very beautiful! PTI designers have introduced amazing color combos. Looking forward to more ideas. Living in Maine and only a few miles from the ocean, I can sure appreciate all these beautiful products today!! LOVE LOVE LOVE! I’ve enjoyed how the DT explored color with these sets. The underwater scenes were so creative. And I appreciate that these are sets that you just can stamp and end up with an amazing card. No coloring required! First of all, let me say I liked a lot the video with Julie and Ashley introducing day one products. It was a nice surprise! And second, this new Salt Air collection is super cute and different from the latest products. All those creatures full of colors make happy and vivid cards. Congratulations to all. Day 1 introduction … so far, so good!!! Ok these are just fabulous! I love all the sea creatures! The beach is my happy place. This series of stamps and dies is gorgeous! I can’t wait to play around with these. So pretty, and love those cute, punny sentiments! Wow, what super cute projects! Love that it is so different. 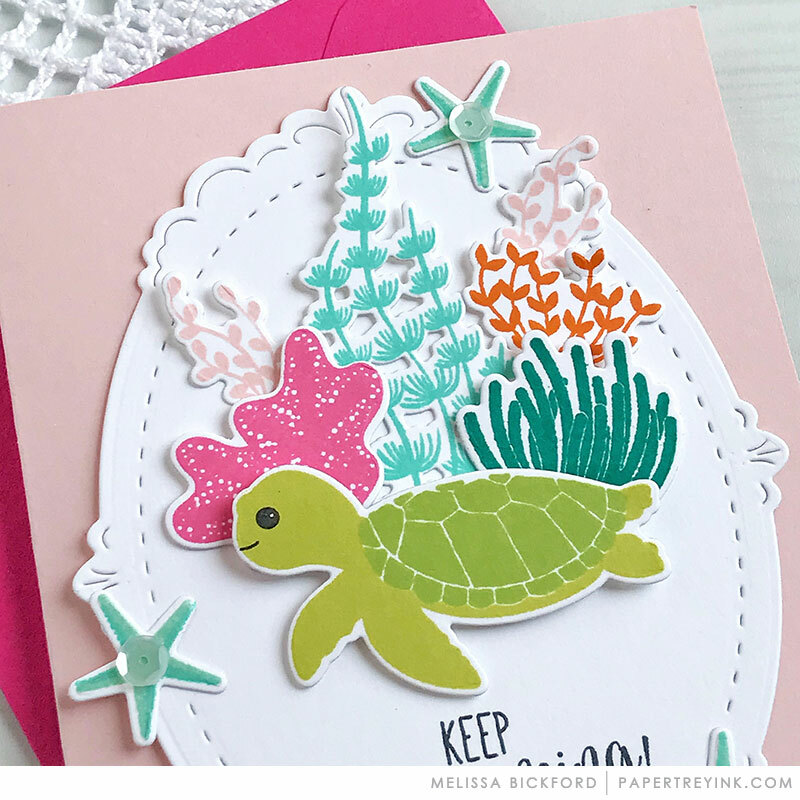 These Sea Turtles and Sea Horses are sooo cute, perfect to make cards for boys or girls, win/win!! Love the “punny” sentiments. Those are always a favorite of mine! Love all the sweet underwater creators…so much fun! 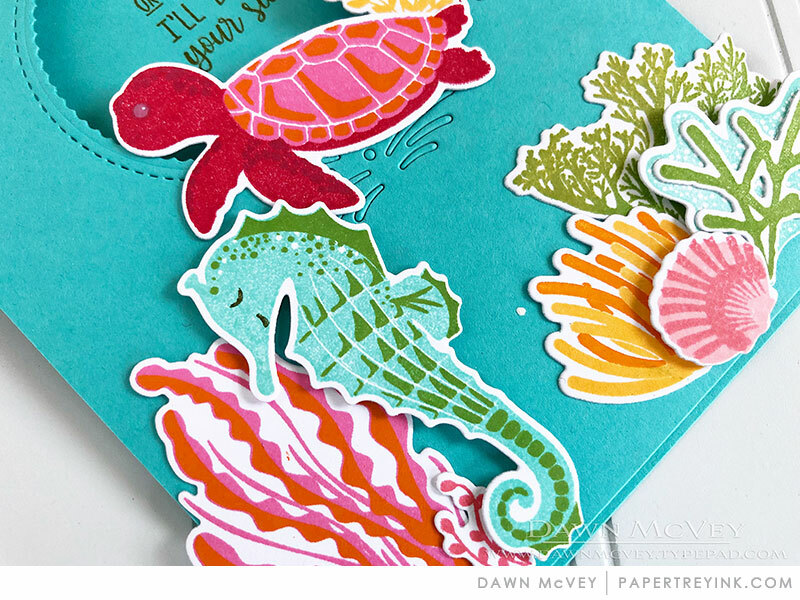 I love these sweet sea life stamps and sentiments! The images and sentiments are perfect for underwater wonders. What a great start to this month’s release. Nice cards! I love reading all of the tips! Thanks! I love these new stamp sets! The cards the design team made with them are incredibly beautiful. I am so happy to “sea” so many ocean and beach themed sets out there but this is surely one of the best! Just Wow!!! Love the sea theme and cards! The DT knocked it out the park today with their amazing creations. Love these sets–the turtles are too cute. What a clever set of stamps. Great for boys. The samples are so beautiful. I really like the sea theme. Perfect for summer cards. What fun new stamps and dies! The turtles are so adorable ❤️ I love all the beautiful scene building the team has done on their projects! Underwater Exploration – what a fun set! Love the sentiment – Hugs and Squishes! Wow! What amazing designs for this fun set. I would LOVE to have these. These are one of my all time PTI sets. This is perfect for summer. It reminds me of snorkeling in Hawaii. I like that these images are the best balance between too detailed and too cutesy! I love them. I have been wishing for some more beach themed stamp sets from PTI and I have to say Betsy definitely delivered! Love the beautiful plant images and the sea creatures both. The detail in the stamps and dies are amazing. 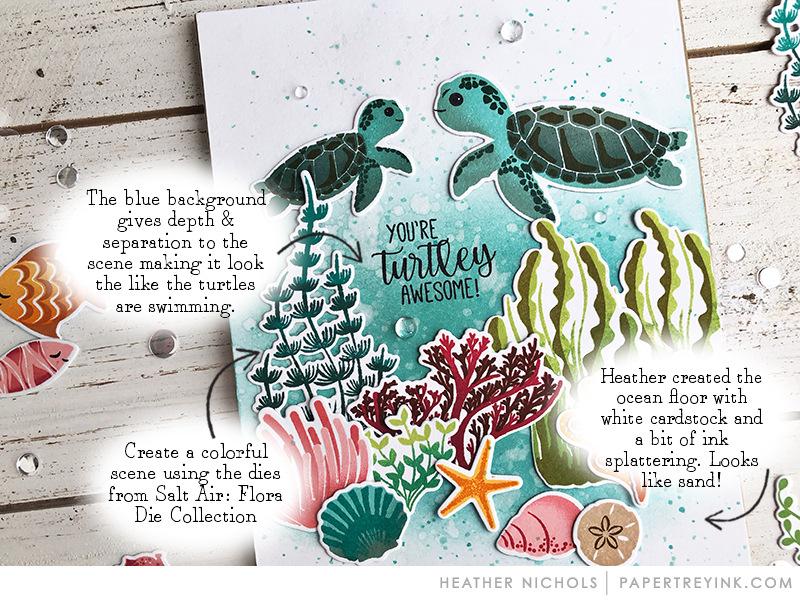 The seahorses and turtles cards are so sweet. Such awesome cards! PTIdid it again with an amazing Salt Air collection…wow! That Betsy does it again. The Salt Air collection is amazing!! Love the seaweed,coral etc. I don’t have a seahorse in my collection and this one is so adorable yet realistic. Cannot wait. I love, love, love this whole ocean world! Kudos for imagining it in such a wonderful way! Wonderful projects! Salt Air Flora and Fauna are perfect underwater sets. On my!! These sets are darling!! Love all the projects too! I love this release ! It is fabulous including the samples!!! Another great set from Betsy ! Thank you for offering them and a chance to win! Oh what a fun group of products! Love them! What an adorable set to start off this month’s release. I love how different the same sets look when used by the different crafters. These samples are BEAUTIFUL!! I want it all, but especially the seahorses!! Both cute and masculine. The Salt Air collection makes creating masculine cards super easy! 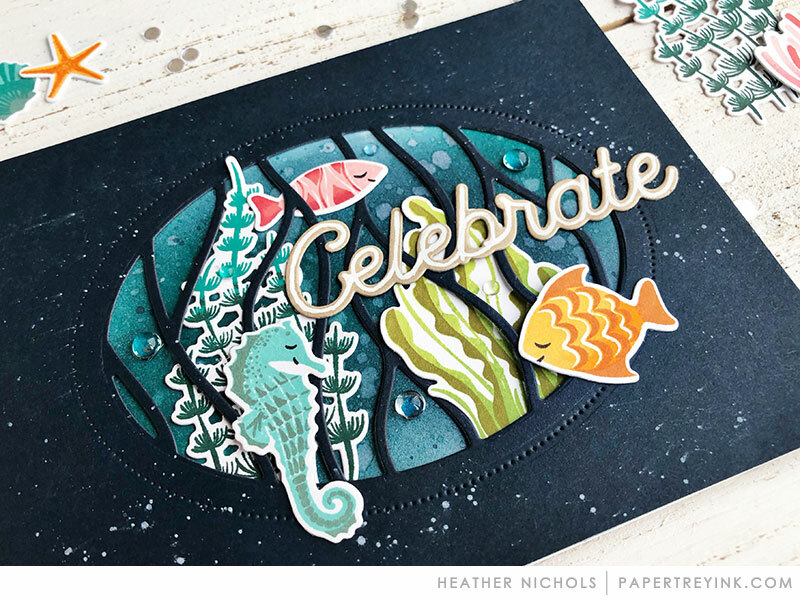 I love everything showcased today, and can’t wait to order these sea-themed stamps and dies! Thanks for the chance to win a gift certificate. Love all these colorful &fun cards! My oldest daughter has loved sea turtles since she was a baby. I look forward to using these sets to make cards for her. I love these beautiful, summery sets! Wow… All the samples today are amazing. I can see so many variations for cards using these stamps. Love the ocean/sea theme. These will find their way into my cart!! Such adorable sea creatures, esp. the turtles. Wow, such amazing card designs by the team. So inspirational and love them all. Love these cute stamps/dies for the ocean theme. Everything looks wonderful. Wow, I am really excited about this release. Such adorable sets. What fun ocean themed products. Fantastic inspiration! Beautiful design. I like that that you split it up into several smaller sets so we can choose what complements the sets we already may have. Eek, so adorable. Love the turtles and Betsy’s creations! Oh my goodness, I love everything shown today! Betsy has done a fabulous job with the detail, especially for people who don’t like to color or feel coloring challenged (me). Beautiful work done by all the DT!! Fun new sets! Love the theme! Awesome theme this month. I am so in the mood for the beach! Love the ocean theme! Hoping Flora and Fauna is a new series. So colorful! These are really detailed under water scenes . I must have this set as I’m leaving my Hawaiian vacation and the highlight was swimming with the turtles. 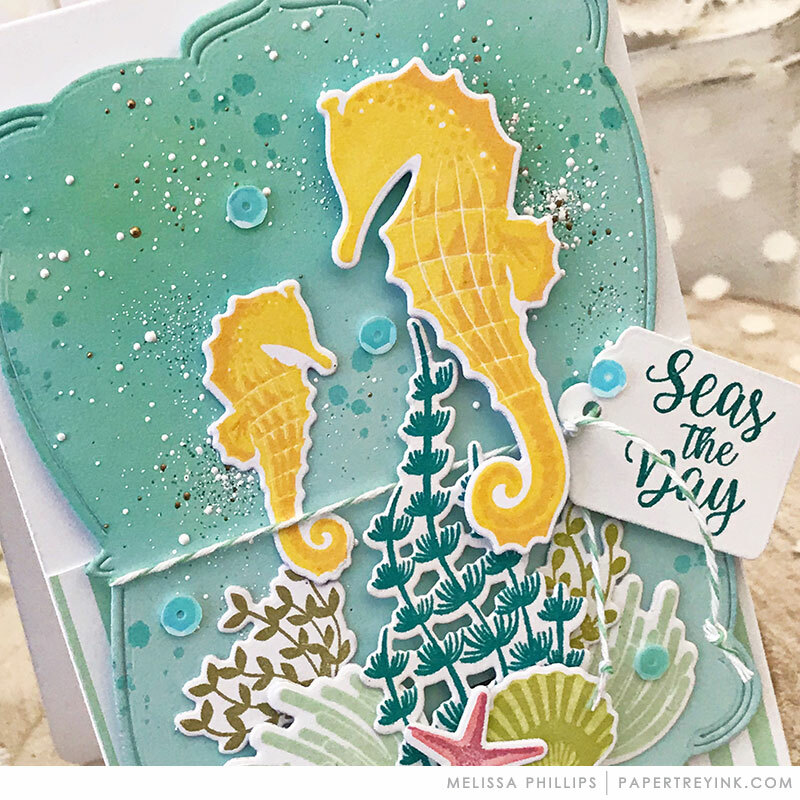 Love the Salt Air Flora and Fauna stamp and die sets by Betsy as well as all the beautiful DT projects showcasing these products…thanks for sharing. Truly incredible! 😮 The jellyfish have to be my favorites! Happy Summer, everyone! I loved the intro video; it was the right length and a nice way to quickly highlight and see the new sets. I love all the Salt Air designs and dies!!! And the card samples are very inspiring; such a great variety! These are not the type of images I’d normally gravitate to, but the DT sure make them look fantastic! The playfulness and the beautiful colours make these seem like a must have summer stamp sets. What a great set to create with. This is such a fabulous stamp collection! A must have in my house!!! Wow….such a different set!!! Love it all! What fabulous sea sets!!! And just in time for summer!! Loving everything I’ve seen so far. Off to check the DT blogs. Fintastic new products. I can’t wait to play. It’s nice to see a theme that is new for PTI. Beautiful projects today. I love these stamps! That turtle is too cute! All of the sea creatures are adorable! What a fun set! And great card inspiration! Just got home late last night from a trip to the ocean! What a lovely surprise to see these sets this morning! I love everything I see on the sneekpeek! These are just fabulous stamps, dies & inspiration projects. Absolutely love everything today! The projects by the design team are stunning! Love all the bright colors! Were’s my scuba gear. . . . wait, maybe I’ll just try to recreate these beautiful scenes with cardstock and your lovely stamps. It’s all on my wish list! These cards are spectacular! So excited for this release! Oh my! That turtle is just too cute! 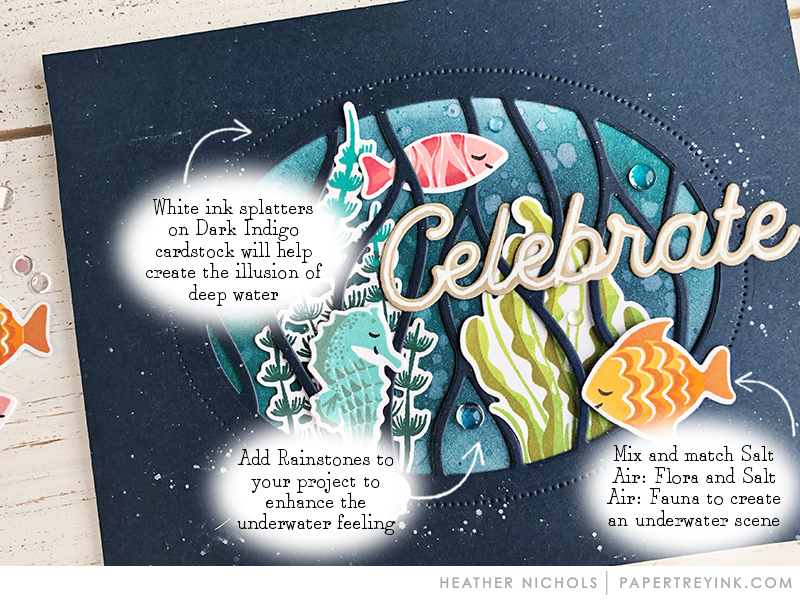 The underwater cards and products looks like so much fun , I love the sweet turtle and seahorse! I hope you have lots on hand …. I think its going to be a huge success! Wow! I love the new products!!!! I love the sentiments in this set! How fun is this going to be! Love all the layering you can do with these dies! Such cute cards today! Love the ocean theme! Such beautiful cards – Love the details in these sets! These are all so cute, especially the turtles. What a fabulous month this is! I love all the underwater sets, they will fill a void in my stash! Fantastic projects once again from the design team! Fantastic cards designers. Each card is amazing! These new stamps are adorable. I love them and all of your great examples. I love these sets! The cards you all made are fantastic!!! Can’t wait to see more. Oh my! I believe this is another awesome release! What a wonderfully whimsical set, and all the color combination possibilities will be delightful to work with! 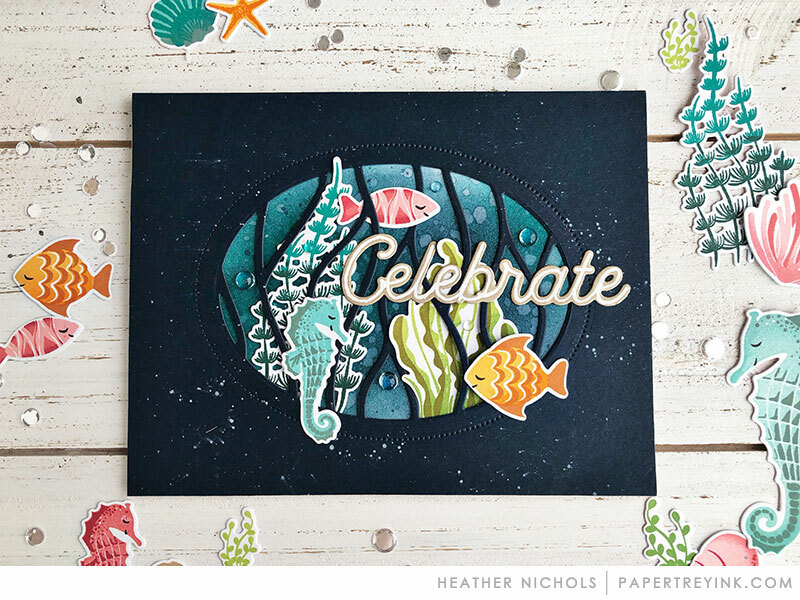 This release is one of my all-time favorites – love all the details on the underwater stamps. And I can’t wait to get my hands on those adorable turtles! What a clever set of stamps and sentiments. I think these are great for children an adults. The examples are inspiring. Love the sets, and the colorful cards are all gorgeous! Oh, these sets look amazing! Wonderful, wonderful under water sets! That turtle is so cute! Beautiful underwater adventure! Especially the plant life. This set is amazing! Love all the inspiration. Those seahorses and turtles looks amazingly real! Already purchased the nature notebook stamps and dies yesterday! 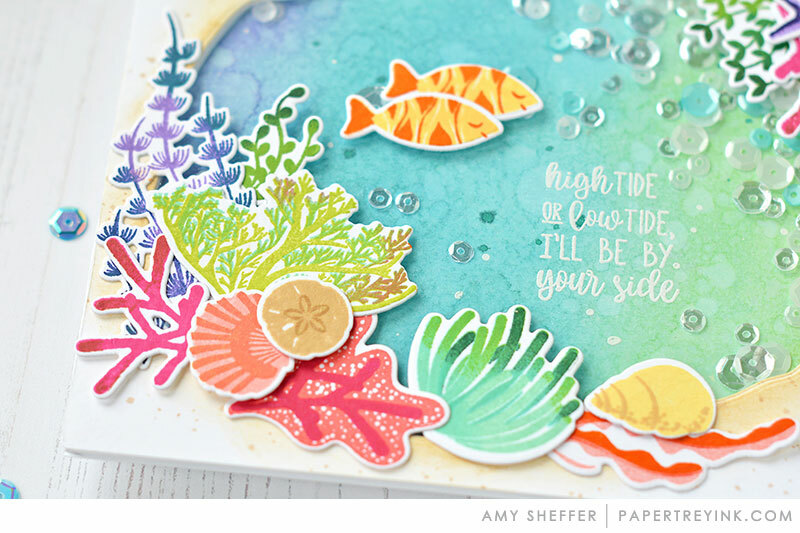 Love the brightly colored salt water fauna card and “squishes” sentiment. Fun!